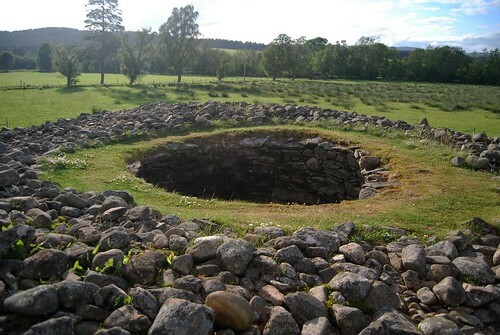 Southwest of Beauly are Glens Affric and Strathfarrar. Glen Strathfarrar, the lesser known of the two, is unspoiled and considered by some to be the more beautiful. To get there, take the A831 nine miles south from Beauly to Struy and follow the signs. Access to the glen is restricted by the owners, Scottish Natural Heritage, to 12 cars at a time and you have to leave by 1900. The glen is also closed from mid-August to October. But once you're in there is a tremendous feeling of peace, and there's good climbing, fishing and walking. The little ungraded road runs for 14 miles all the way to the impressive Monar Dam at the head of the glen. Glen Strathfarrar can also be reached from Drumnadrochit, via Cannich. The A831 continues south from Struy through Strathglass to the village of Cannich, gateway to glorious Glen Affric, a dramatic and beautiful gorge, with the River Affric rushing through it, and surrounded by Caledonian pine and birch forest (this is one of the few places where you can still see the native Scots pine). There are few, if any, more stunning sights in the Scottish Highlands and it's perfect for walking, or even just to drive through and stop for a picnic on a nice, sunny day. Glen Affric reaches west into the very heart of the Highlands and is great for a spot of Munro-bagging. Beyond Loch Affric the serious walking starts. From Affric Lodge, nine miles west of Cannich, begins a 20-mile trail west to Morvich, near Shiel Bridge, on the west coast near Kyle of Lochalsh. This strenuous walk is for experienced hikers only, and takes around 10 hours. You can stop off halfway at one of the most remote youth hostels in Scotland, Glen Affric Youth Hostel, at Allt Beithe (no phone; open mid-March till end October). There are also many shorter, easier walks around Glen Affric. There are some short, circular marked trails at the end of the road which runs west from Cannich almost to Loch Affric, and also from the car park at the impressive Dog Falls, 4€ miles from Cannich and a great place to stop for a picnic and swim. Cycling in the forests around Cannich is good too - you can hire bikes at Cannich Caravan and Camping Park. Glen Affric can also be reached from Drumnadrochit by heading west on the A831 through Glen Urquhart to Cannich. Just before Cannich, on the road from Drumnadrochit, a single track road leads left (south), past the Caravan and Camping Park, to the tiny village of Tomich. From here, it's a three-mile hike up a woodland trail to a car park. A few hundred yards down through the trees takes you to the lovely Plodda Falls. An old iron bridge affords a spectacular view of the waterfall as it plunges 150 yards into the foaming waters below. The Slaters Arms in Cannich does good pub food and local beers and malts - website. There is not much on the road between Cannich and Struy. Just east of Struy is Cnoc Hotel with award winning restaurant and a bar - website or call T: 01463761264. There is a good Spar in the village of Cannich for supplies on a day to day basis. Highland Bus & Coach, Tel. 01463-233371, runs buses 3 days a week Mon-Fri from Inverness to Cannich and Tomich, via Drumnadrochit. There are also buses from Inverness to Cannich and Tomich, via Beauly (2 on Tue and Fri, and 1 on Sat). There are also a couple of hostels: the SYHA Cannich Youth Hostel, Tel. 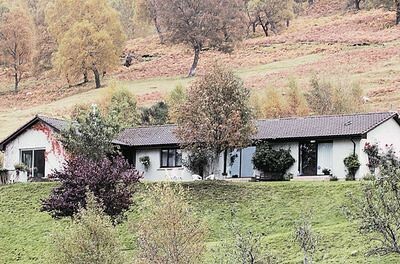 415244, open mid-Mar to end Oct; and the slightly cheaper independent Glen Affric Backpackers, Tel./Fax. 415263, which is open all year and is just wonderfully remote and the real deal. 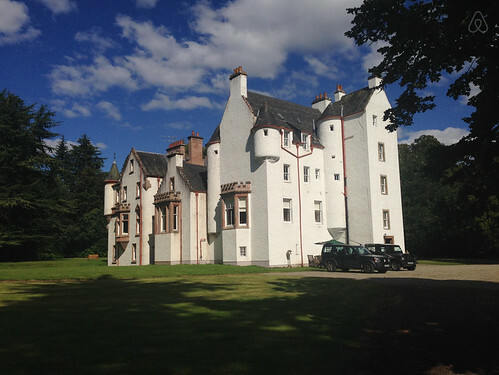 In the village of Tomich is The Tomich Hotel, Tel. 01456-415399, Fax. 415469. The price includes dinner, and it's a comfortable place with good food and free use of the nearby indoor heated pool; also great for fishing holidays. Near Tomich is the independent hostel Cougie Lodge, Tel. 01456-415459, which is open Apr-Sep and will pick you up from Tomich or Cannich if you phone ahead - 2016 we think this has closed now.